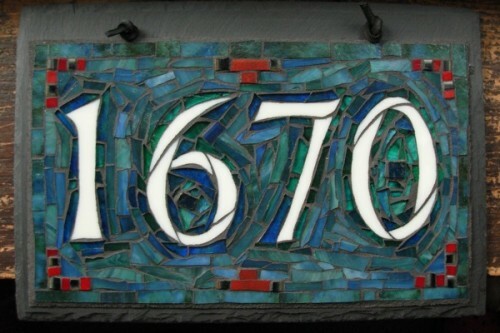 Custom Mosaic House Number 1670 in Teal and Rusty Red by Nutmeg Designs, 12×8″ on slate. It is a bluish grey with darker charcoal grey roof, with dark teal and white trim. Inside, they’ve decorated with many items from Alaska trips, so the colors on the outside of their house remind me of weathered totem poles. I was thinking white numbers on a dark teal or teal and blue mixed field, maybe with contrasting details of dull red or yellow for the totem pole idea. . . This made me think of one of my favorite artists, the Canadian Emily Carr(1871-1945), and some paintings from Emily Carr: An Introduction to her Life and Work by Anne Newlands. 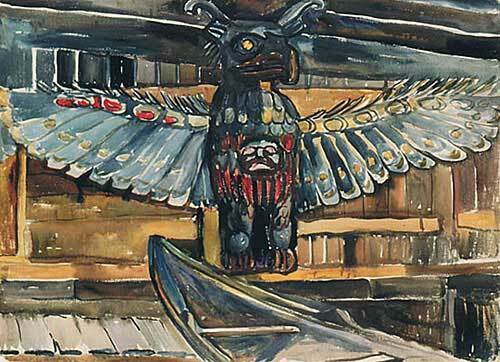 Emily Carr made totem poles a central part of her art, and in 1912 visited over 15 coastal First Nations villages in Northern British Columbia, drawing and painting the carvings. The watercolor that I remembered from Newlands’ book was House Post, Tsatsinuchomi, BC, with the weathered blue-green and bits of red. Working on this house number commission was a delight, and several other clients have asked to have those colors in their signs. Check out Ghir’s Flickr Photos of her 2010 Trip to Alaska for more totem poles. Order your House Number here at Nutmeg Designs Etsy Shop. That turned out perfect! Not only does it reflect some of the totem pole inspiration, but it almost looks like holly berries decorating the numbers! I love that image of holly berries! It’s beautiful. I love the colors and the inspiration. Welcome! 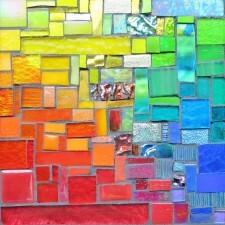 Thank you for the kind words about my mosaic. Your blog title “Sentient Marrow” is awesome–just wanted to let you know that!